"It's a filthy job getting to the top, but someone's got to do it." 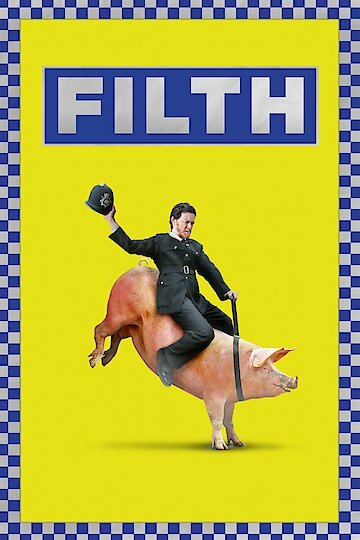 Filth is a crime drama film that was released in 2013. The film's main character is a man by the name of Bruce Robertson who is a corrupt, bigoted, and misogynistic policeman who desires nothing more than to get a promotion. In order to do this the police officer has to solve a murder, and to also ruin the reputation of a kind hearted police commissioner. The man does this by engaging in a lot of scheming, taking large amounts of drugs, and by hallucinating as he works his way to the top. Along the way he must attempt to rid himself of his bad habits in order to find success. Filth was written and directed by Jon S. Baird. It is based on a novel that was written by Irvine Welsh. The character Bruce is played by James McAvoy. John Sessions plays the police commissioner, and the film features additional performances by Jamie Bell and Eddie Marsan. Filth is currently available to watch free on Tubi TV and stream, download, buy on demand at Hulu, FlixFling VOD, Amazon, Vudu, Google Play, FandangoNow, iTunes, YouTube VOD online.